Cabo de Gata Park is a place I would love to stay forever! Preserved nature, wild beaches, relax atmosphere… When you feel the wind blowing on your hair and the sun kissing your skin, it is love at the first sight! After some busy days in Barcelona and Valencia the Spanish Natural Park was a present to our bodies and souls. We stayed four days in Cabo de Gata, but I wish we had more time to enjoy it. The park is not only beaches and nature, there are many forts, ancient ruins and tiny villages. Beautiful scenery, like postcards inviting you to sit, relax and appreciate the view. The are so many beautiful places to see and thing to do in Cabo de Gata that we could stay there two weeks. Our journey started early in the morning at Almeria Airport (where we found the best rates for renting a car). From there we follow the signs to Cabo de Gata – Níjar Natural Park and in less than one hour we were in front of this intense blue sea and stunning desert landscape. It was middle of June, hot weather and the beaches weren’t crowded. Cabo de Gata is still a secret destination in Spain. For sun & beach seekers like us, that was PERFECTION! 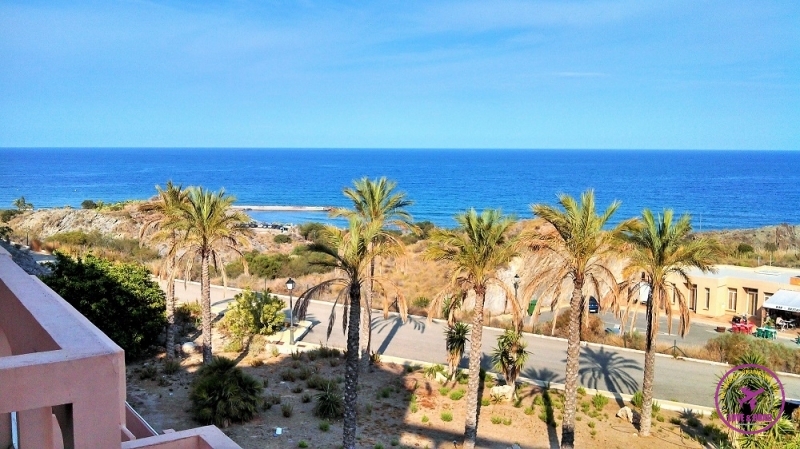 Our hotel was located almost in the end of the Cabo de Gata Park, near Mojácar city. In our trip to there we crossed the whole park. One place more beautiful than other. The first day was all about travelling and shopping some groceries. We booked a place with kitchen and it was such a smart idea. We saved some bucks cooking our breakfast and dinner, also we didn’t need to drive late at night to find restaurant and bars. Nothing better than a nice Spanish wine, some freshly home-made food and an amazing sea view! When you drive till there you think it´s going to be a nice preserved beach. You park your car on the top of the hill and have to walk around 20 minutes to reach the sand. When you arrive there you think to yourself “Ohhh, this is a beautiful beach!”. One second later, when you turn your head to the right side, you spot a huge rock split in half that allowed you to pass to a secret part of the beach and then: OMG!! Wooowww.. Is this real??? Charming coloured stones invite you to sit, the clear water is perfect for snorkelling! Find your spot and enjoy. With some home-made tuna sandwich in the bag we spend the whole day on the beach! This beach is an untouched paradise. Hidden between mountains the only ways to reach the sand is by boat or by 2 hours trekking. Of course we choose the walking path and we don’t regret. All the tiredness and sweet were worthy, the view you have from the cliff above the beach is beyond words… You feel how nature is powerful and how we have to respect and look after it! Cala San Pedro is the only beach inside the park that has people leaving in the woods, like hippies. 🙂 It´s a green community, with bungalows and tents built on the shore and next to a water spring. They look after the beach and protect the environment, that´s why they are allowed by law to live there. During summer time more people camp on the sand for a few days, just to enjoy the unique atmosphere. Meditation, Yoga on the beach… Such a great vibe. No doubt Calle Cala de San Pedro is my favourite beach in Cabo de Gata Park. The best part: not so many people. An opportunity to connect with yourself and Nature. Different from the other two beaches, this one is more urban but still beautiful. It´s surrounded by a charming village, nice restaurants, bars and even beach clubs. A good place to stay if you don’t want to be far from all the modern life facilities. The beach has a nice and green promenade that invites you for some jogging or a morning walk. We couldn’t resist, in our second day we woke up early to run and enjoy the beach just for ourselves. This is a tiny village in the middle of the Cabo de Gata Park. 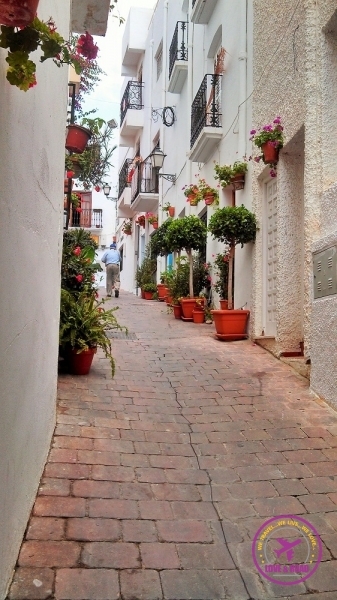 The curvy streets are packed with guest houses, boutique hotels, fishermen and cheerful people. Great place to stop for a meal. The town has many restaurants, for every taste and budget. 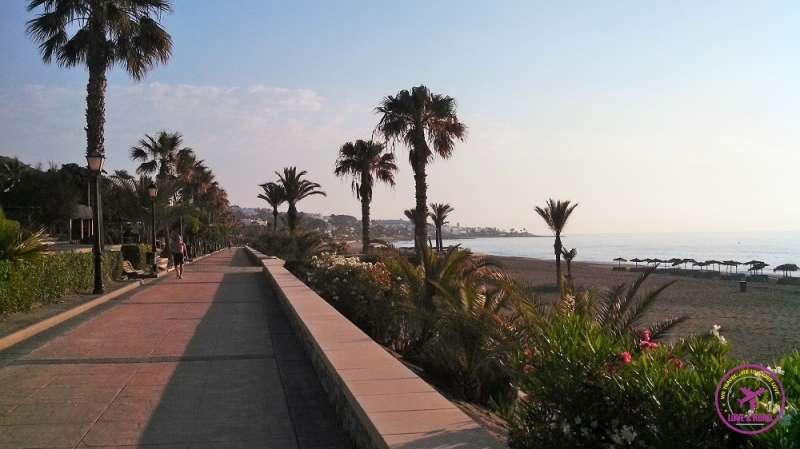 After some Spanish delights, have a walk around the city or maybe a siesta on the beach! This town is not in front of the sea, but totally worth to drive away from the coast and go up the hill. Once you reach the top, the Spanish village and the view will enchant you. Park you car and go explore the city, most of the tiny streets can be only reached by foot. White buildings with purple bougainvillea, small cafes and street market, what else can we ask more?? Where to stay in Cabo de Gata Park? There are plenty of options around the park. From big resort hotels, to B&B and apartments to rent. It all depends on how much is your budget, your travel style and how long you are planning to stay. If you are going for more than 10 days, for sure it´s better to rent your own place (you can get a nice offer on Airbnb). Just for a few days there are nice resorts all-inclusive or you can book a nice hotel room. If you like camping or you have a Campervan there are many sites where you can park your car and stay for the night. Driving through the Cabo de Gata park and beaches we spotted many campers by the sea, people having lunch, relaxing and enjoying. At this website you can find useful information about camping sites. It´s not only the beaches that attract people to the Spanish natural park. Adrenaline seeker will find lots of fun there. From cycling, running, to dive and kayaking… There are many sports that can be practiced in the Cabo de Gata area. In the cities you can find schools and instructors for many kind of sports. And if you have an adventurous spirit, trekking is a must thing to do there. You see, Cabo de Gata is a place we can easily fall in love. The nature is stunning, so many things to do and see, great weather and Spanish culture. The park is still a secret destination in Spain and you need to visit before gets packed! Most of the travellers don’t know about the park, and we didn’t find travel agencies selling holidays package to there. How did we discover Cabo de Gata Park? Our Spanish friend told us about it, and we love it! Thanks Belen, that was one of the best travel tips ever! We are so happy and grateful that we visited Cabo de Gata-Níjar Natural Park. It´s such an unique place, I´m sure it will enchant you too! Your pictures are so amazing! I just check and this place is on a way I planned for us for June next year! So happy! We will go there for sure! That´s so cool!! You will love Cabo de Gata, such an amazing place! And June is the perfect time to visit it! Wow, what a beautiful place. But if you love beaches, you’ve got to visit the Canary Islands. Especially Gran Canaria province which shades Tenerife province on that front. I´m happy that you liked it!! If you need any advice, don’t hesitate to drop us a line. Have an amazing 2015 too!!! Lovely! I can definitely see why you guys so enjoyed your time here — thanks for sharing it so others can enjoy this place’s beauty as well! I’m always on the look out for tucked away little gems, so thanks for this tip! If you have the chance, GO to Cabo de Gata. It`s truly paradise!!!! Wow, the colour of that water is something else! We go down from time to time to visit my mother-in-law who’s in a home near Alicante, and I never knew this place existed! We’ll definitely add it to one of our visits. Thanks for the tip! Around May & June the weather is great and prices are reasonable. My hubby and son will be there next in February, but I’ll suggest it for the trip after that! I absolutely adore Spain and continue to be amazed at how many fantastic places it has for us to explore. I’ve not yet been to Cabo de Gata or to the Canary Islands, but they’re both on my list! We liked Cabo de Gata so much that it`s again in our plans for 2015. Great post about this hidden gem! We were here earlier this year and June and fell in love with it. Also really enjoyed the San Pedro beach – probably among the clearest water we’ve ever swam in. Just a beautiful and unique place and nice to have it all without the crowds. We fell in love too ! Ignore the above comment ^^. I’m pretty sure that my computer is possessed and it posted the reply for me as I was typing. Oh, technology. We can’t live far from the sea neither. For us is the best place to go if you want to relax. Awesome that you already visit Cabo de Gata Trisha!! We were so lucky, almost all the beaches were empty and we could enjoy all that beauty just for ourselves. Cabo de Gatas is a truly paradise! Thanks for stopping by Maaike!! So glad that you liked the post and the place. Cabo de Gata is a pearl, definitely worth a visit! How Much Does it Cost to Travel in Portugal?